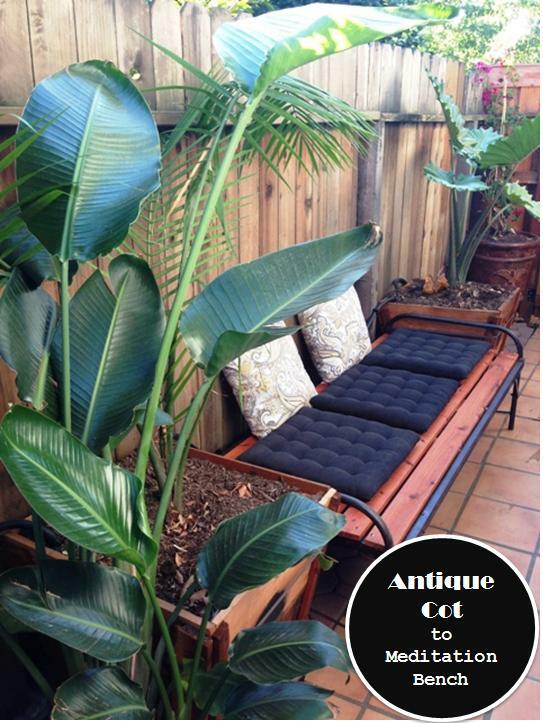 What Bali inspired side yard would be without a meditation bench? A peaceful spot to enjoy the quiet and serenity… Or your bench could be taken over by two over-sized dogs? Either way this DIY bench can serve two purposes. 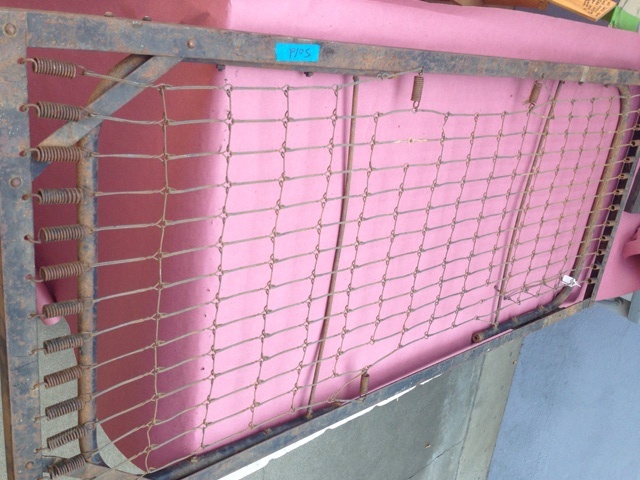 We scored an antique collapsible cot at the Sacramento Antique fair a few weeks back for $15. It was a bit rusted and the springs were ready to snap. 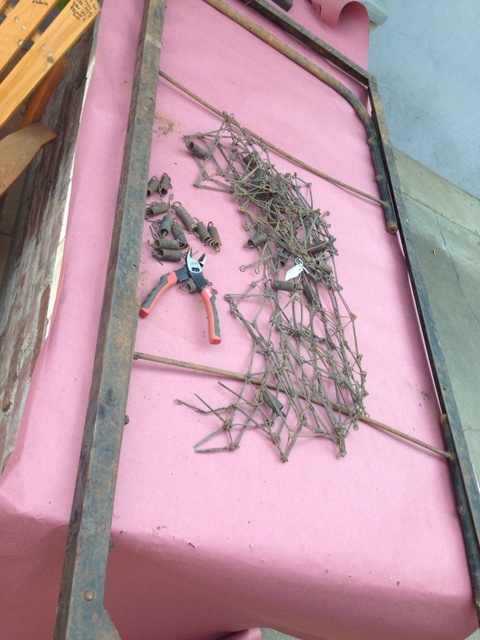 First we cut away the mesh and springs with heavy duty wire cutters. 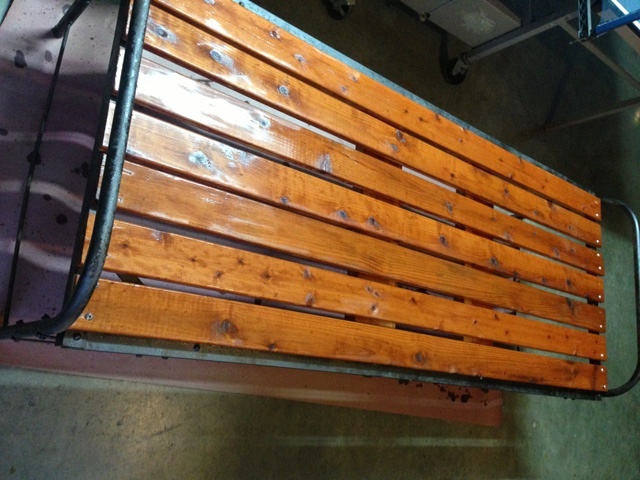 We gave it a quick spray of black spray paint, Rustoleum’s rust reformer to cover most of the rust. However since we had only a little left, and wanted an antique look we only used one coat. 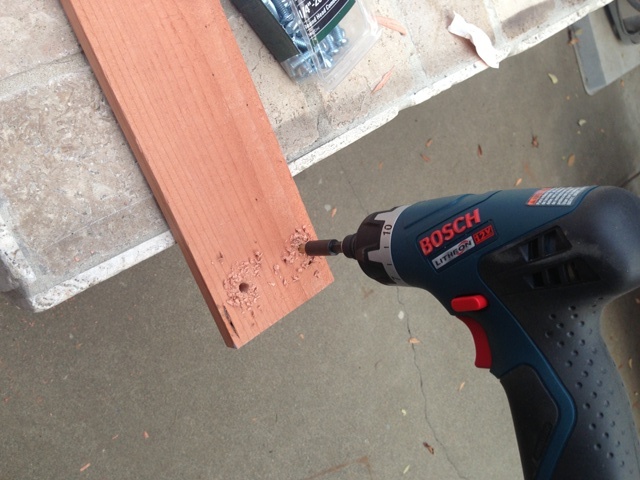 Then we had Home Depot cut 4 of the 12 foot (2 inch x 1/2 inch) sanded redwood boards in half for the bench slats. Also we found two pieces of redwood 2x4s in their scrap bin and had them cut to 29 1/2 inch pieces which we used for the under base to support the middle. Once everything was home we placed all the wood on the cot as a “mock up”, then used a sharpie to mark where each hole would be. Using a 1/4 ” bit, drilled holes in the wood at each mark. Then we screwed our 1/4″ machine screws into the wood. 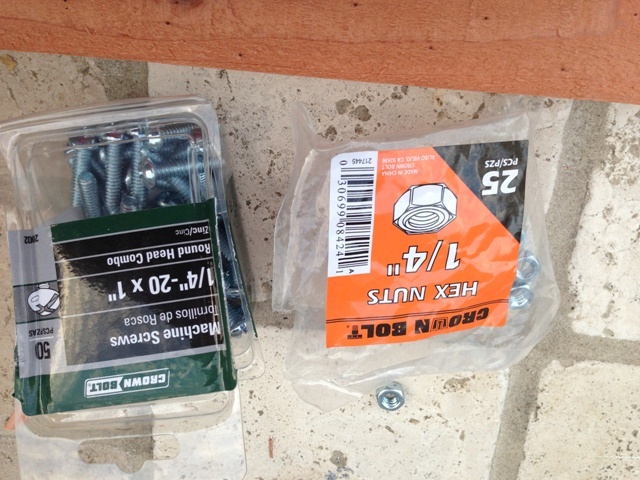 Each screw was secured to the cot with 1/4″ hex nuts underneath. 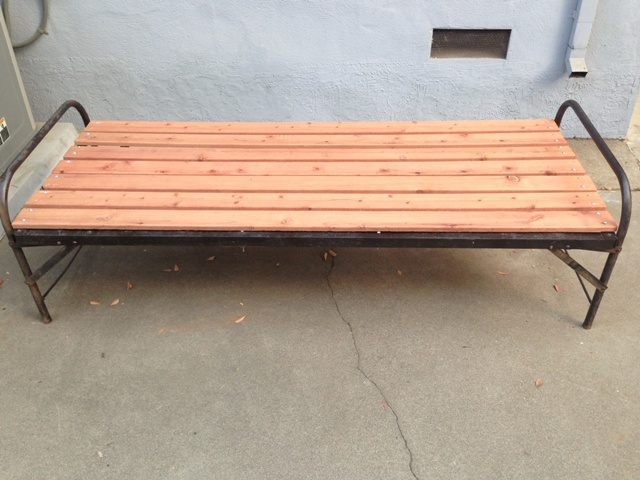 Once dried, we placed our new meditation bench in the side yard. 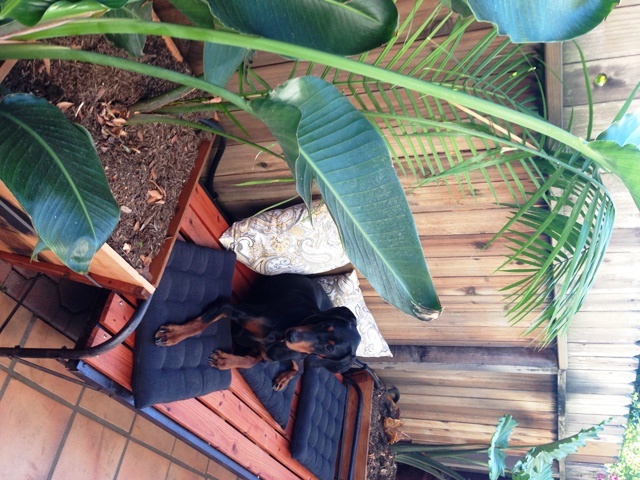 Of course, before we could even snap the perfect ‘after’ shot, Sierra found herself a new bed. So what will it be, a meditation bench or outdoor dog bed? 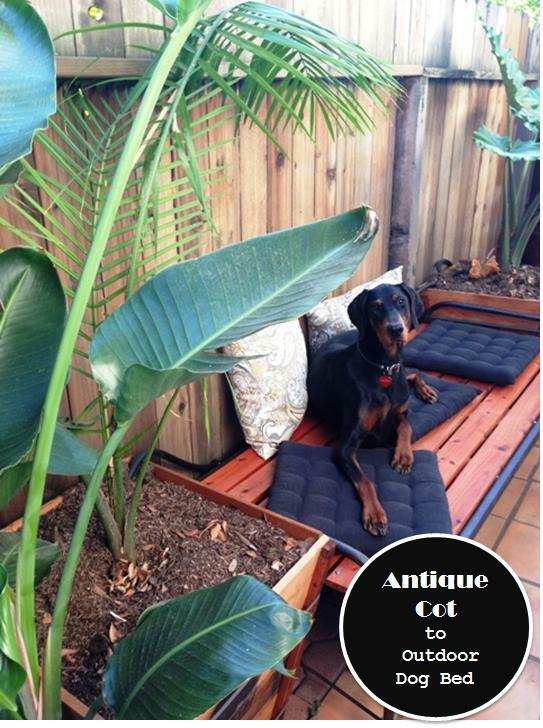 This entry was posted in Uncategorized and tagged Bali side yard, Cheap bench idea, DIY bench, How to make a meditation bench, How to make an outdoor dog bed, ideas for antique cot, meditation bench, meditation platform, outdoor dog bed by Tandra. Bookmark the permalink.